The Miami HEAT face the Golden State Warriors Sunday night at Oracle Arena. Tip-off is set for 8:30 PM, and television coverage is on FOX Sports Sun. You can also listen to the action live on 790 The Ticket. 1: What happened down the stretch in Sacramento? Couper Moorhead: Their offense just sort of fell apart. Defensively the HEAT weren’t very different in those final six minutes, only they were now defending possession upon possession after missing one of their own shots which allowed the Kings to get out and run. For most of the first half Miami was executing at its best, constantly forcing their opponent into long help rotations with their usual package of pick-and-rolls and handoffs. Just like in Portland, every time the Kings appeared poised to make a run, the HEAT found a way to string together makes – Wade was particularly big in both games – to keep the lead around double digits. But when the Kings kicked their defense into high gear everything turned. Miami stopped getting open looks and the turnovers, such a demon this season, started showing up again. We’ve seen Miami have lengthy offensive lulls at the end of games before, and up-tempo teams can certainly go on runs when you’re missing shots. 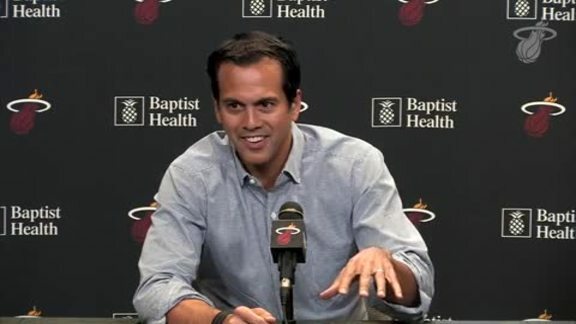 What probably frustrated Erik Spoelstra the most were the loose balls they weren’t able to get, two of which led to second-chance scores from Harrison Barnes and Buddy Hield. They won’t always hit their shots, but built into this team’s margin for error is that they rely on out-hustling their opponents. Friday night, the Kings won the big-time 50-50 plays. Joe Beguiristain: Simply put, the HEAT just got cold. After whipping the ball around and obtaining great looks in the first half, Miami’s offense got stagnant and Sacramento took advantage. Then when you factor in the HEAT’s 13 turnovers after the break, you see why they came up short in the end. And although the result was rather disappointing, Miami’s sharp defense shouldn’t go unnoticed. In addition to rising to the occasion with a team-high nine points on 4-of-5 shooting in the fourth, Josh Richardson absolutely wreaked havoc on the defensive end and paced the squad with three blocks and a 94.0 defensive rating. Hassan Whiteside, meanwhile, led the way with 12 contested shots and five deflections. All told, the HEAT held the Kings to just 99.0 points per 100 possessions after Sacramento entered the night with a 108.9 offensive rating. 2: How has the introduction of DeMarcus Cousins to the starting lineup changed the Warriors? Couper: Since Cousins made his debut against the Clippers on January 18, the Warriors are 8-1, outscoring opponents by 14.1 points per 100 possessions. The starting lineup with him in place of Kevon Looney has scored 119.1 points per 100 in 81 minutes, and that group is undefeated when it plays. So, yes, the already incredibly-great Warriors got even greater. Cousins gives them a dimension they haven’t had before, however. Even when the team effectively swapped Harrison Barnes for Kevin Durant a few years ago, they essentially swapped one skillset for the most maximized, MVP-level version of that same skillset – long wing scorer and defender – in the league. Golden State has never had a big man of Cousins’ level before. Typically they’ve had play finishers and solid screen setters in the middle, with some solid passers in the mix over the years. They’ve never had someone like Cousins who can essentially do everything, shoot, pass, score, defend, rebound and push the ball in transition. He’s raised their offensive ceiling even higher, and defensively, with Cousins looking about as good as you could reasonably expect coming off a torn achilles, they no longer have the same weaknesses to long and strong centers in the paint. We’ve said this before about the Warriors, but it’s possible they’ve assembled the single best and most versatile lineup the league has ever seen. Joe: Although Kevon Looney is a very strong defender who made some noise in the 2018 Finals, DeMarcus Cousins is just a whole different beast. As Coup mentioned above, Cousins can shoot the three, handle the ball, finish at the rim and defend at a high level. In particular, that versatility has been on full display over the past three games, as Cousins is averaging 17.0 points, 7.0 rebounds, 3.7 assists, 1.7 blocks and a steal per contest during that span. And now with him in the fold, Golden State has a starting five that could essentially be an All-Star team since each guy in the lineup can do multiple things on both ends of the floor and change the complexion of a game in an instant. Before we wrap up this question, it’s important to note that Cousins is on a minutes restriction until after the All-Star Break. Now, he did go a little over his 25-minute limit on Friday against the Suns due to Draymond Green getting ejected, but that was a special case. Regardless of how much run Cousins gets, you know he’s going to make the most of it. Couper: The good thing about the Warriors, for their opponents, is that they’re so good in so many different ways they can sometimes flip on cruise control during the regular season. Just Friday night, for example, they let the Phoenix Suns hang around for a spell before putting them away by double digits in the fourth quarter. Considering their all-time pedigree, sometimes you just need the Warriors to help you out by not playing a full 48 minutes. Whatever happens, the HEAT will probably have to play their best game of the season up and down the roster. That means hitting their threes, keeping their turnovers down and moving the ball. All things they need to do on a nightly basis as part of their usual winning formula, they’ll just have to do them all at the same time. There aren’t any shortcuts Sunday night. You know what absolutely has to happen, though? The Warriors cannot shoot well. They are 23-0 when topping 40 percent from three. In their only loss in regulation of 2019, they shot 28.9 percent from deep. When Miami famously beat them on Dion Waiters’ game winner two years ago, they shot just 26.7 percent. You see the theme. Miami has had some success in the past going as hard as they can over the top of screens and contesting Steph Curry and Klay Thompson, but at the end of the day you have to make all their open looks as contested, even slightly, as you can. And if you over-pursue at the arc, Golden State is plenty comfortable living in mid-range, where they also happen to be the best shooting team in the league. At their best, Golden State doesn’t have many weaknesses anymore. There isn’t anything on paper you can outright exploit. The best you can do, and what you have to do, is try and get them to not be their best, which means forcing turnovers and contesting threes. Joe: The Warriors are back-to-back champs for a reason, but there are a few areas Miami could exploit. First off, Golden State tends to get a little nonchalant with the ball at times knowing it could likely shoot its way out of it very quickly. In fact, the Warriors allow 17.1 points off turnovers, which ranks them in the bottom half of the league in that metric. If the HEAT can scramble defensively and win the 50-50 battles, they might be able to get some easy ones on the other end. On the flip side of the ball, it’s imperative that Miami moves the ball around and fires from deep if guys are open. While Golden State is holding teams to a pretty low percentage from downtown, the team is giving up 25.7 non-corner three-point attempts per game, which is among the most in the league. At the end of the day, though, this is the Warriors we’re talking about. Any minor flaw they do have can be masked or eradicated with a crazy spurt at any given moment. 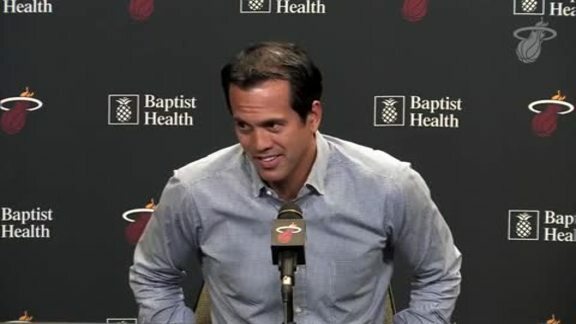 Long story short, the HEAT will have to be ready for one of their toughest challenges yet. The HEAT are 25-28 on the year, while the Warriors enter the contest at 39-15. Josh Richardson has shot 52 percent against Golden State in his career, which is his second-highest percentage against any opponent. Stephen Curry leads the Warriors in scoring at 28.7 points per game. Dwyane Wade (Back Contusion) is questionable, while Derrick Jones Jr. (Right Knee Bone Bruises), Goran Dragić (Right Knee Surgery) and Yante Maten (Sioux Falls Assignment) remain out.